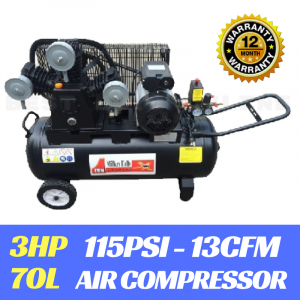 The single phase 50L belt driven air compressor features a TRIPLE cylinder pump, 7" solid rubber wheels & 10AMP plug-240V. 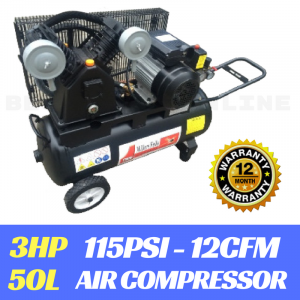 This 50L tank, belt driven unit is the ideal air compressor to use with most air tools requiring a constant and continuous supply of compressed air. Product Applications: For all trade or handyman use. 50 litre Air Tank Capacity. Shipping Dimensions: 88 x 42 x 83 cm x 88kg.